Checked the HSI website today and noticed something new under rates. 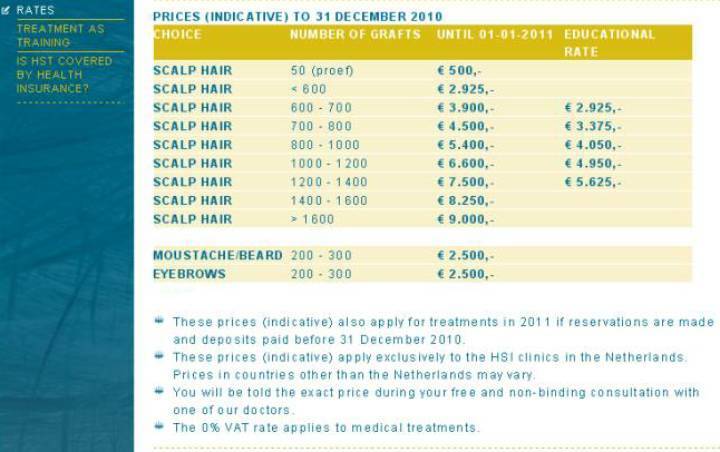 Gho is now offering 50 grafts for 500 euros as a proof session, next to this rate was the word “Proef”. This is Dutch for proof/test as far as I believe. I thought this was interesting. Any takers!! » thought this was interesting. Any takers!! really cool! i’ll donate 20euros to someone willing to try this and provide regular photo documentation of the progress… would be great if we all pitched in. » » was the word “Proef”. This is Dutch for proof/test as far as I believe. » » thought this was interesting. Any takers!! i’d donate 20 euros too! In any case, looks like things are moving in the right direction. I would be more than happy to contribute my share for a test for the benefit of Hairsite readers. Gho seems awfully confident about this procedure. Either he is nutty or it actually does work. » he is nutty or it actually does work. This is for HM, is that correct ? If two or three of you here intend to take up the challenge and have the HM transplant, please take pictures and document it. This should settle the issue. » This is for HM, is that correct ? It is hard to prove unless you are willing to let Gho tattoo your head to pinpoint where the donor was taken from and where the grafts were put in the recipient. Its hard to verify if Gho is not just transplanting hair from the back to the front instead of multiplying hair with just 50 grafts. We need a method to easily confirm/reject whether HM actually occured or just a regular transplant before we pronounce Gho’s method as genuine. I’m thinking if Gho is agreeable, perhaps 5 of these transplants could be performed on arm hair where the donor follicles can be more easily kept track of with zoom in high res pictures if its near the hand. Transplant it from that region to a ‘hair free’ region. If both areas are producing hair after 6 months, he’s got something. 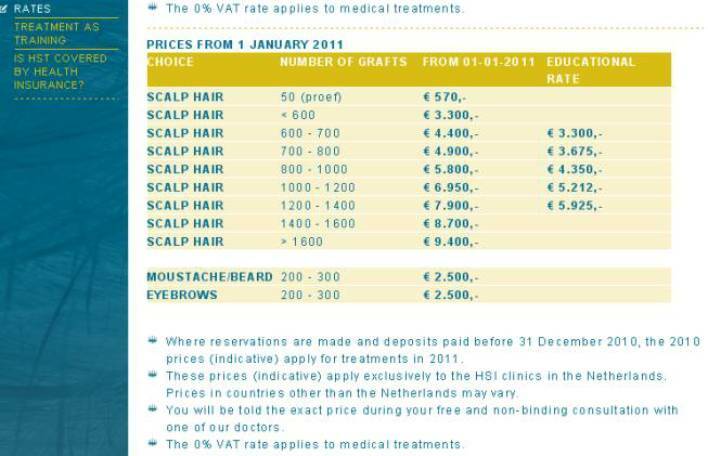 » the front instead of multiplying hair with just 50 grafts. » just a regular transplant before we pronounce Gho’s method as genuine. » hair after 6 months, he’s got something. Honestly if People would Donate, i would gladly be the test subject for all here. SOmeone has to do the first step and i would do it. » » » the recipient. » » the front instead of multiplying hair with just 50 grafts. » » just a regular transplant before we pronounce Gho’s method as genuine. » » track of with zoom in high res pictures if its near the hand. » » hair after 6 months, he’s got something. » SOmeone has to do the first step and i would do it. I am happy to contribute if you have a way of proving this scientifically. I dont want to spend the money and you come back saying: “oh yeah, the donor kind of grew back but I don’t really know for sure because I don’t remember exactly where Dr. Gho removed the follicles from.” I will smack you silly if I pay the money and you come back with a report like this! I think this “test” thing have been misinterpreted in the forum. I don’t think it means a test to check whether the donor and recipient hair grows. It is probably for customers to check that recipient hair grows so ht works. » I think this “test” thing have been misinterpreted in the forum. It doesn’t matter what it translates to. The translation thing is a red herring. This essentially allows us a relatively cheap way to test the procedure which is of prime concern to us. James Bond - would you be willing to administer this? You seem to have by far the greatest knowledge of any of us in this area. If you go as far as donating money to a person to has this done i suggest you notify Dr.Gho as well about the situation. He can make sure to take appropriate photos and such and maybe mark the area somehow. Then you should find an independent doctor that can check the outcome 12 months after and share with us his findings. » after and share with us his findings. hey guys… i suggest that if we setup a donation account perhaps via paypal we will need someone to act as a trustee and maybe then forward the money to dr. gho directly rather than to some candidate willing to have this administered to him. I also suggest that we act with full transparency as to how much has been donated by whom etc… does anyone have experience as to how this could work? I’ll do some googling on this… and if i find something useful i can get back to you. Seriously, if Gho is to be involved in this test and is confident in its success, I’m sure he’ll forgo the paltry 500 euros for our test subject. No? » success, I’m sure he’ll forgo the paltry 500 euros for our test subject. Its not a test for Gho its a test for you to see if your suitable for procedure.Thats the way I read it. There again I think it a sc*m (FORGOT HAIRSITE DON’T ALLOW THIS WORD,HOW PATHETIC),as in the last several years this procedure as been marketed,not once have we seen proper photos or nothing.Is that because he as no happy patients or perhaps they are over the moon and to busy,I doubt that. Please stop taking Gho half serious! 500 EUROS IS NOT A LOT OF MONEY! Are you able to prove that? » Are you able to prove that? Its not for me to prove.I have researched for a few years now on hair multiplication.So far its all amounted to a big nothing. No one as shown any proper evidence of any kind of hair multiplication. I believe it will happen one day,but in the meantime we should all get used to being bald,or have an hair transplant and chase hair. Also which bit don’t you understand you thick SH*T! School children club together to save 500 euros not adults.